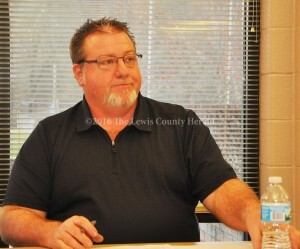 Bryan McRoberts conducts a meeting of the Lewis County Board of Education Monday evening. The Lewis County Board of Education approved a revised restructuring plan presented by Superintendent Belinda Forman during the March session Monday evening. Last month the board approved a portion of a restructuring plan proposed by Forman but agreed to table any action on a part of that plan until the March meeting. Board Chair Bryan McRoberts had asked Forman in December to develop a proposal for dealing with a projected budget shortfall of about $500,000. • Abolish director of district services/assistant superintendent position for a savings of $25,373. • Abolish all elementary assistant principal positions for a savings of $120,032. Forman said she wanted to comment on a portion of the plan the board adopted in February.